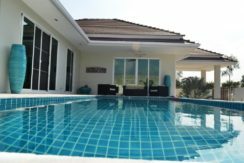 Luxury pool villa with great mountain- and river views in natural tropical surroundings offering peace, tranquility and privacy – still only a short distance from Hua Hin city. The villa is part of Red Mountain/Woodlands Residence quality development. The villa, completed just a year ago, has been upgraded above the normal specification and many extras have been added to the interior and exterior of the house, the result of which is a superb home with every detail carefully considered. The floor plan is open and spacious with a high, vaulted ceiling in the living room for an impressive feel. The kitchen is a modern palette of black and white with gorgeous black backsplashes, down lighting, and super high-end appliances. The covered terrace next to a 4×10 meter large swimming pool, is a perfect relaxation and dining area. Further, you’ll find a large interior storage and utility room as well as an external storage and utility room. o Increased house size above standard size provides a more spacious look and feel. o Increased terrace and roof line to include 2 useable terraces on either side of the house, giving shade during any time during day. o Extended pool size from standard 8 meters to 10 meters. o Added guttering around the front of the house to keep rain off the terraces. o Upgraded kitchen (Danish brand Kvik, superior Hua Hin kitchen supplier). o Sandwash around the entire house perimeter to protect from water damage. o Tinted windows in living room, kitchen & master bedroom for privacy, better insulation and a noticeably cooler interior. o Bathrooms upgraded with beautiful and modern tiles. o Upgraded AC unit in master bedroom to more energy efficient inverter type. o Ceiling fans added in every room. o Fly-screen added at all sliding doors. o Marble internal window ledges. The Villa is sold furnished except personal items. Ownership is leasehold (but can be transferred to freehold). Download description at: www.dansiam-property.com/5568008 and mail or call for viewing (+66(0)81-860-9611 (English/Thai) /+66(0)81-820-3496 (English/Scandinavian)).